Let me state (without giving spoilers) that Civil War breaks all of these predispositions. The plot itself feels incredibly tense, and after eight years of build-up in the Marvel Cinematic Universe, the emotional investment that a viewer can get from this film is understandably deep. 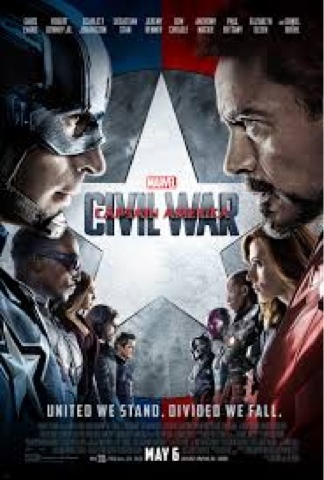 There are several points in this film where one must choose who they aline with morally: “Team Cap” or “Team Iron Man,” but the end of the day, both characters’ sides are so well-supported that neither of their stances over super hero accountability are incorrect, because both sides have such substantial credibility. Captain America: Civil War almost feels interactive, in that once you subscribe to a side, you are drawn into the rollercoaster to see what happens to the team you’re rooting for. The characterization in this film is incredible, with lead actors Chris Evans and Robert Downey, Jr. playing Captain America and Iron Man, respectively. Both team leaders did a remarkable job of not only rallying their team of Avengers to their individual teams, but also to draw the viewer in with their masterful acting and charisma. This film also introduced us to the characters Black Panther (Chadwick Boseman) and Spider-Man (Tom Holland), both of which have promising futures as newly-inducted heroes of the MCU. Finally, the realism of this film is what drives it home. Once the viewer submerses themselves into the technologically-advances world of the Avengers, the tension, emotionality, and drama of this film feel absolutely realistic and substantiated. The friendships (and rivalries) that have been developed in this universe’s movies all come to fruition in Civil War, and the Russo Brothers’ direction of this film makes the tension feel real and meaningful. All in all, Civil War is going to be an absolute hit, and you do not want to miss this film while it is in theaters. The action scenes alone are worth seeing on the big screen, not to mention the deeply-invested plot, the incredible characterizations, and the emotional investment that this film brings to its viewers.